Every day, consumers walk through the aisles of grocery stores all over the world looking for the ingredients needed for the perfect meal, the perfect snack or the perfect thirst-quenching beverage. Given the current economic conditions, companies that make these products need to do everything in their power to ensure that consumers choose their products over those of their competitors. This means that companies need to make sure that are effectively communicating and delivering their brand promise each and every time their customers interact with their brand. As I mentioned in a post last week, making a better product is definitely part of the process. However, there are times when a brand can lose market share even though its product meets the needs of consumers better than its competitors’ products do. When this happens, every possible explanation should be examined. In some cases, the solution might be as simple as changing the design of the package or container that the product is sold in. In examining this topic, Gladwell gives several real world examples of companies that made changes to the packages that their products were sold in, in order to increase sales. Gladwell pointed out that the consulting firm that Cheskin founded, Cheskin Added Value, demonstrated a particularly elegant example of sensation transference when they studied two competing brands of inexpensive brandy. Their client, Christian Brothers, wanted to know why they were losing market share to E & J, even though their product wasn’t more expensive or hard to find, and they weren’t being out-advertised. After several studies, they concluded that the reason that Christian Brothers was losing market share to E & J was due to the fact that E & J had a more appealing bottle. After the tests, Christian Brothers redesigned their bottle, and, sure enough, their problem was resolved. 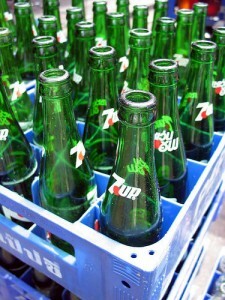 Another example that Gladwell gives involves the color of the container that 7UP is sold in. When Cheskin Added Value tested the color of the container, they found that when they added fifteen percent more yellow to the green on the package, people actually reported that the taste experience had a lot more lime or lemon flavor. The product was the same, but a different set of sensations were transferred from the bottle. And, some people actually got upset about it. Malcolm Gladwell gives a few more examples of sensation transference in his book. Fortunately, he gave J.D. Roth the permission to post an excerpt of the book that deals with sensation transference on getrichslowly.org. I suggest that you take the time to read it; it’s interesting stuff. You can find more information about this topic when you look up Louis Cheskin on Wikipedia. You also might want to visit the Cheskin Added Value website. There are many things that you need to consider when you are looking for ways to increase sales of your product or service. In order to maximize sales, everything needs to be considered — even the design of the package that your product is sold in. I think that “sensation transference” is an interesting concept. I definitely plan to learn more about it in the future. And, when I do, I will be sure to blog about it. Photo credit: nickgraywfu on Flickr.